Liveaboard boaters and their friends on the K&A have been running a food bank to provide food for boaters and anyone in the waterway community who is in need. With the current roll-out of Universal Credit (UC); benefit sanctions; payment delays and possible problems with UC over Christmas 2017, many more people are likely to be in need this winter. 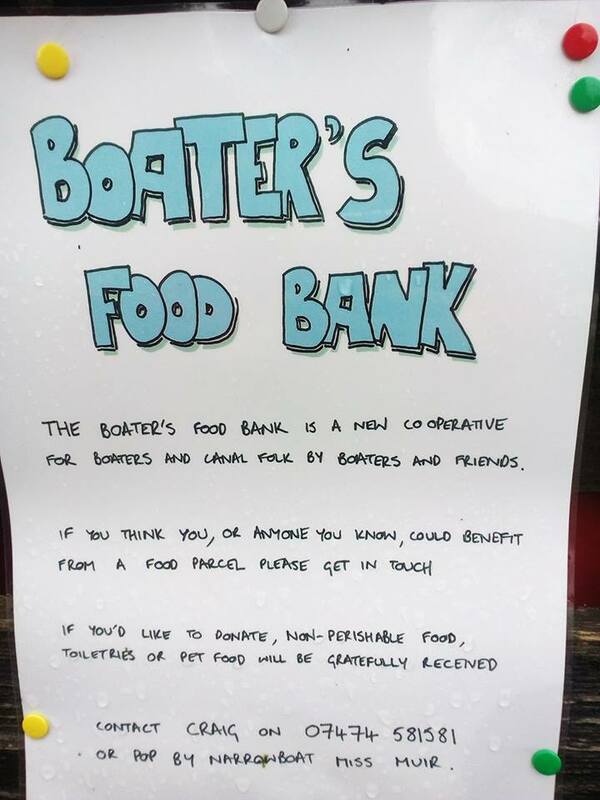 If you know of anyone who would benefit from a food parcel, or if you wish to donate non-perishable food, toiletries and pet food, please contact Craig on 07474 581581 or call in at narrowboat Miss Muir. Finally, Julian House Travelling Community Support Service have food parcels to give out. If you know anyone who is in need of a food parcel, contact 07960 097719 or samw@julianhouse.org.uk or catch them on the first Tuesday of the month on the outreach boat Litania which is run jointly with Canal Ministries, where you will also find hot food, tea and coffee, internet access for benefit applications etc and other support. This entry was posted on Sunday, December 31st, 2017 at 11:41 pm	and is filed under Community, Resources. You can follow any responses to this entry through the RSS 2.0 feed. You can skip to the end and leave a response. Pinging is currently not allowed.